SCVHistory.com CS2801 | Saugus Speedway | Hoot Gibson at Baker Ranch Rodeo, 1928. Cowboy actor and trick roper Hoot Gibson greets spectators at the Baker Ranch Rodeo in 1928. He would purchase the rodeo arena two years later. Eventually it came to be known as the Saugus Speedway. 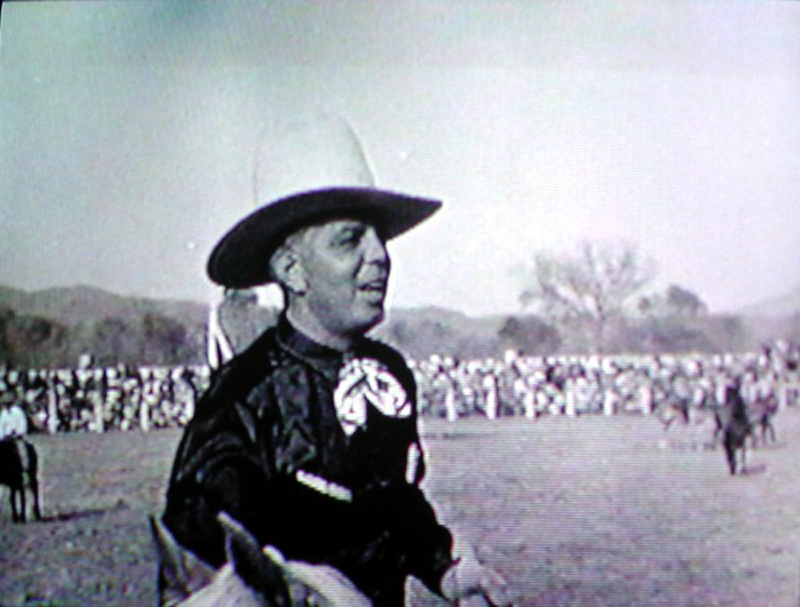 Image is a screenshot from 18 minutes of film shot by Clyde Hamilton Smyth, father of former high school superintendent and Santa Clarita Mayor Hamilton Clyde Smyth, Ph.D. The elder Smyth was at one time a bronco buster on the rodeo circuit. Note: The two views are quite similar. CS2801: 9600 dpi jpeg from screenshot of film contributed to SCV Historical Society by Dr. H. Clyde Smyth.